Sphere of Annihilation: D&D Blog Hop Day 22! 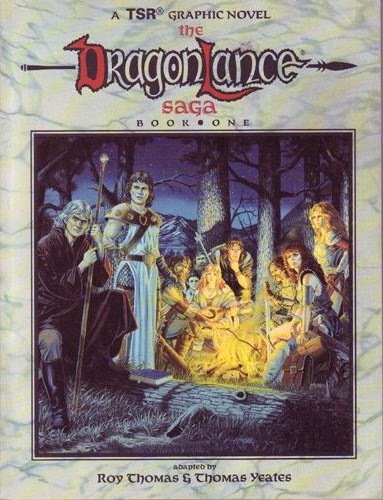 The first time that I read D&D fiction was when I picked up a copy of the Dragonlance Saga graphic novel from Waldenbooks. I was book #1 and it had an awesome cover on the front showing the characters camping, and it had another awesome picture on the back of three of the characters facing off against a dragon that has Raistlin trapped under its claw. I read that book over and over. I loved the scene where Raistlin reads a scroll and the letters vanish off of the parchment. I remember thinking, "So that is how that works." I also liked that fact that Raislin was sick, I had never seen a main character with such a physical fault before. I read the novel Dragons of Autumn Twilight years later, and I realized that the graphic novel adapted the first half of the book.